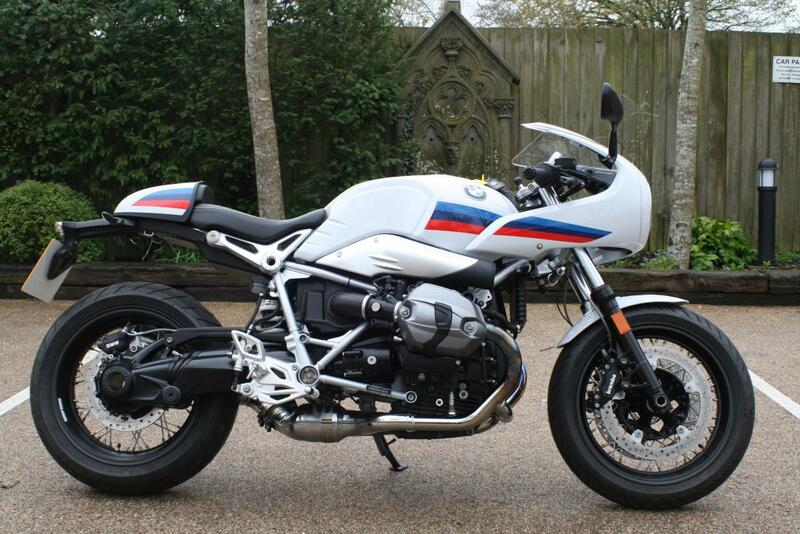 We are delighted to be able to offer you this brilliant BMW R NINET RACER SPORT. Complete with ABS , Traction Condition and fantastic cross spoke wheels. German Heritage at its very best!! Strong character. Dynamic. Air-cooled!! The BMW R NineT Racer lets you relive the era of legendary superbikes. Far removed from obsessive retro romanticism, but rather on a customisable bike with innovative technology and in customary BMW Motorrad quality. Crouched behind the striking half fairing, both hands tight on the low-slung handlebar grips, you can feel the powerful boxer work, you hear its unmistakable roar. And you already know, only a strong character can hold the racing line. On the road, as in life., , Style in the fast lane., The design of the R nineT Racer unmistakably takes inspiration from the motorsports of the 70s. The elongated proportions extend through the entire design and promise pure acceleration. The distinctive half-shell fairing, the tank and the seat shape the slim silhouette. The long wheelbase and the low-slung handlebars positioned far to the front complete the low, sporty seating position. Then the high-set, far back footrests: as a rider, you literally lie on the bike. Surrounded by the white bodywork, which clearly stands out against the dark driving parts and technology. Even the tape that runs from the front to the rear in the BMW Motorsport colours seems to constantly call for the next acceleration. BMW AUB Warranty until April 2020. Low rate finance is available on this bike, credit subject to acceptance. For a no obligation finance quote, please call, 01747 811196 and select option 1. Thanks for looking! !